Here is something a little different this time around. I have been writing about human anatomy for artist's reference, identifying muscles and describing what they do, and I wanted to explain why I write these posts and write a little about how studying anatomy will help artists if they are interested in drawing people. 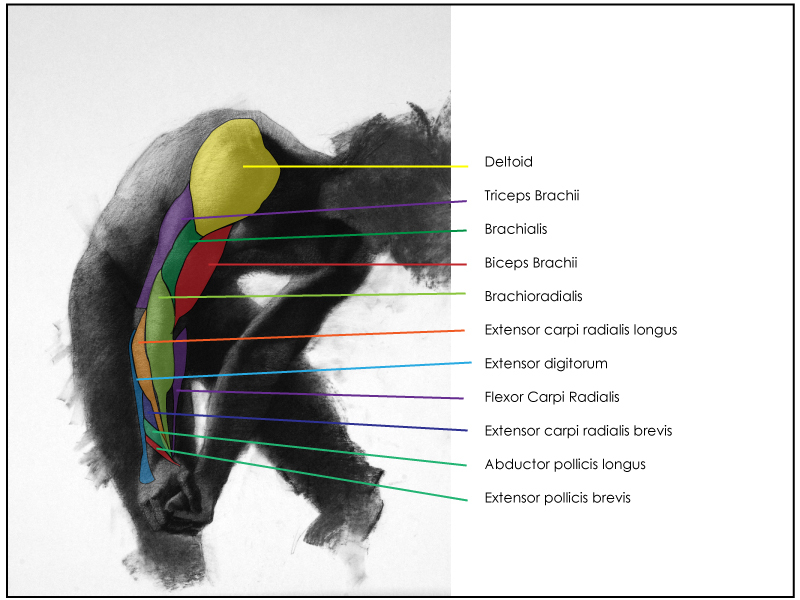 I find learning the human anatomy to be very helpful in my work. The forms created by the human figure are complex. That is to say there is plenty of stuff to work out when drawing the human figure and having an understanding of what is creating those forms makes it all easier to work out. 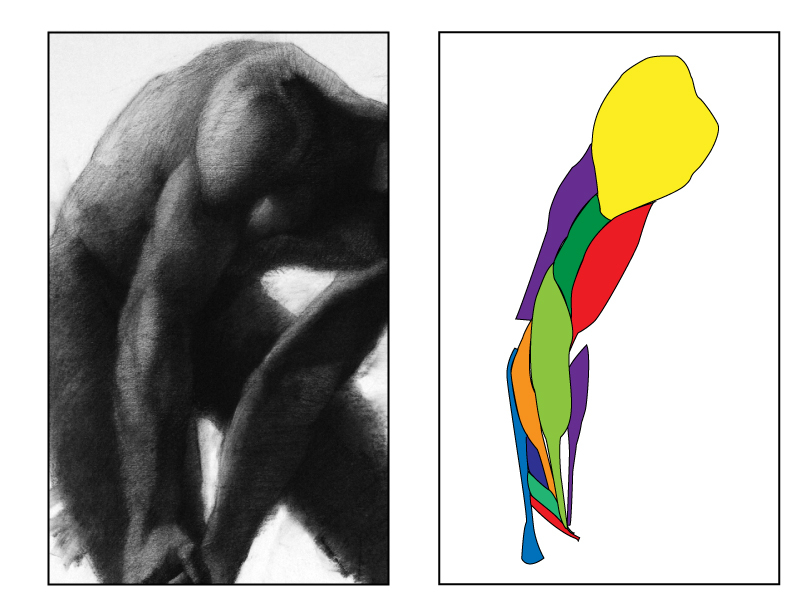 Today, we will look at a drawing of a male model to see how an understanding of the underlying muscular anatomy can guide us in figuring out how to draw the forms we see. Here is the drawing we are going to look at today. 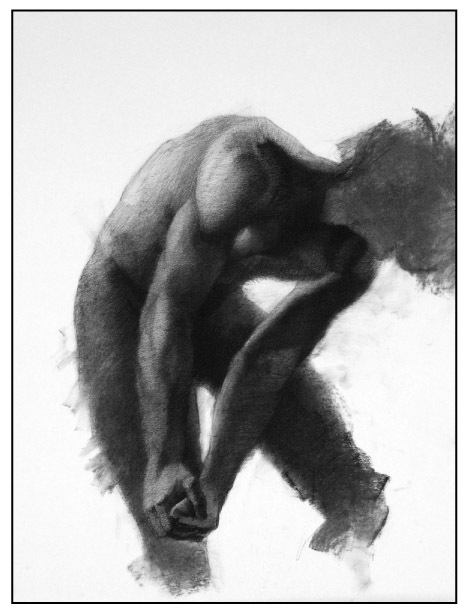 In this figure study I focused on the model's right arm. The model was flexing the muscles in the arm to suggest an action. Being that the muscles in the arm are engaged there is a lot more happening within the shapes and forms of the arms. The shapes created by the larger muscles are easier to see. 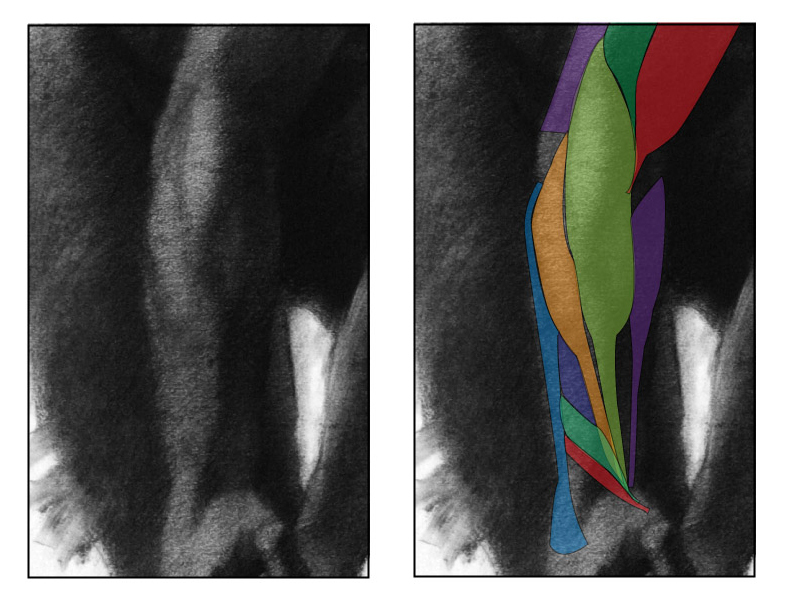 The shapes created by the smaller muscles are harder to separate and define. This is especially true when there are a bunch of smaller muscles grouped together, such as the muscles in the forearm. 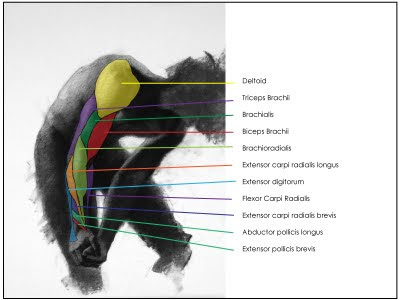 Here is where having an understanding of the muscles can help out. In the image to the right several of the muscles found in the arm are diagrammed in an overlay on top of the drawing to help us see what muscles are creating each shape found within the arm. When looking at the model, the divisions between the muscles are not clearly visible. By relying on the surface information only I am tied to what I see and I might struggle with accurately drawing the arm or making any adjustments. If I can imagine where the muscles are at underneath the surface, I can identify the forms quicker and I can make changes to the drawing if I want to. This information allows me to construct an arm rather than just mimic one. In this next image, I have separated the overlay from the drawing. Compare the forms and shapes of the arm against the diagram of the muscles. When I do a figure study like this, I work out the proportions, size and basic shapes first. Then I start narrowing in on the smaller shapes using the plane changes of surface to help guide me to those smaller shapes. Sometimes it is not easy to identify the surface plane changes and contours created in the body. If I am having trouble I might imagine the muscles underneath the surface to visualize how they push the skin out by their mass. Lets take a closer look at the forearm as this is a good example of when I can get tripped up. The forearm has quite a few muscles located within and there is lots of ways the forearm and hand can move. This will change the shapes of the forearm somewhat as it is moved into different positions. Knowing where each muscle starts, stops, and its approximate size helps me gauge where to put the shadows and lights of the forms. I am then able to draw a more complex arm, with some accuracy. I can also make changes to the position of the arm if I need to. 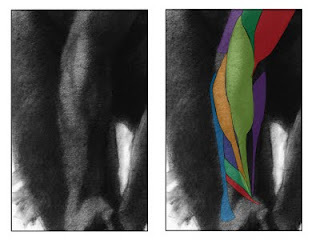 I can adjust the shape of the muscle based on where the muscles are connected and what action each performs. This is also useful for creating figures from the imagination. I do not need to rely on an image or a model to create the character or figure in the pose I want. Thank you very much! The overlay idea is not new, but certainly a useful reminder.